I took this photograph last Spring on our trip to France. I love how most everyone is simply relaxing in the sun, sleeping even, in the middle of the work week. Every week for the last few years, I've tried to create a French themed blogpost like this one, here or at Chapter1-take1 to connect with my friend Paulita's Dreaming of France meme. I call her my friend but we've never met. You know how that weird internet thing can be, connecting you with strangers from around the globe in oddly intimate ways. 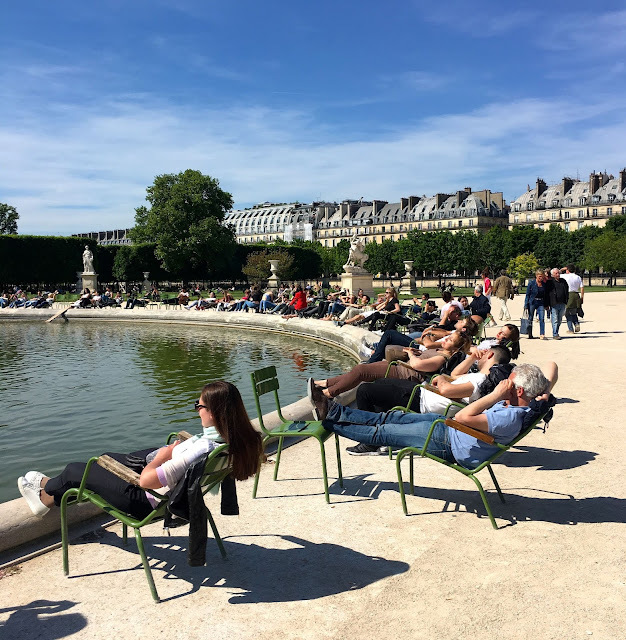 Now Paulita, who has been dreaming and fantasizing about living in France for years, sharing her photos, her memories from her trips, is actually doing it. After taking oodles of journeys to France, waiting for their kids to reach adulthood, scouting out locations, she and her husband put their house on the market. The house is in escrow and in the next couple of months, escrow will close and they'll be gone. Like F. Scott and Zelda, Paulita and her husband Earl, will officially be Expats. I can't imagine how she feels, leaving so much behind but starting an incredible new adventure in mid-life. How many of us have the guts to do what it takes to make our dreams come true? An accomplished novelist, with a handful of books to her name—mostly set in France, as you might imagine—Paulita has been a huge inspiration to me. I want to publicly thank you, Paulita. It's owing to you, watching your progress, and receiving your kind encouragement on the memoir pieces I've posted here, that I've just completed dotting the eyes on the third draft of my own first novel. I started the book last year, during NaNoWriMo, finishing their 50,000 word requirement at the end of the month long period but knowing the book wasn't really finished. Who finishes a book in a month? Well, not me. I've been working on it ever since then, putting in a few hours a day, almost every day for the last year. Now after almost a year with the completed third draft all set, commas in the right places, I'm feeling almost brave enough to seek out feedback. At this moment, I'm trying to figure out how to find an appropriate small group of readers ready and willing to tell me where, in between those polar opposites, masterpiece and crap, it lies and how to make it better. Whatever it is, I wouldn't have done it without you. Oh, Sim. My heart melted a little as I read this piece. I'm so happy that I have inspired you even a little bit. I love sharing this passion for France with you and the other people who read, even if they don't post or leave a comment. Thank you. Also, I want to be one of your readers. We're not technically friends. So email me your novel and I'll get reading.